Another hectic day. We did sleep till 10:00, though, to recover from day 1. Then across the street to see the Church of St. Margaret’s; relatively new (1500’s), compared to its neighbor Westminster Cathedral (1065!). Sir Gordon was married in St .Margaret’s, though, and Jill used to work for Sir James doing fundraising for it. Has an unusual clock tower – a vertical sundial. Then it was in to Westminster Abbey itself – absolutely huge with spectacular vaulted ceilings and stained glass. Of course the place is filled –every square foot – with tombs of famous Brits. Mostly unknown to heathen Americans though – with a few exceptions. We knew more names in Poet’s Corner than anywhere else. Jill thought it was kind of spooky. We remembered the Choir from a Christmas special on TV last year. Had lunch in a pub on the “first floor” (upstairs) of a building down the street. Shepherd’s pie was very good. 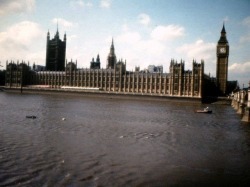 Then back on the Tube to “The City” of London to St. Paul’s Cathedral – where Charles and Diana were married. Also quite spectacular. Jill and I climbed 259 steps to the “Whispering Gallery” at the bottom of the dome, where you can speak against the side of the dome and be heard on the other side! Then I climbed many more circular staircases (588 steps from the bottom, according to Michelin) to an outside view from the top of the dome. You could see all the way from Big Ben to the Tower of London. Took lots of photos, joined Jill at the Whispering Gallery, and back outside. As may be guessed, the weather cooperated again, 70 and cloudy, with a little sun in the a.m.
Oops, before St. Paul’s we went to Trafalgar Square. Nice fountains, weird people, and thousands of pigeons. Some idiots were buying bird seed to feed them – pigeons landing on their heads! Lord Nelson gazing out to sea. After St. Paul’s we had planned to go to the Tower of London, but it was already 4 and we were tired. So, we had a pint at a non-touristy pub and rested a while. Rejuvenated, we hopped back on the Tube to Covent Garden. Trying to find Leicester Square, we strolled around Soho and Covent Garden for a few hours. Bought exotic coffee. Sort of like Greenwich Village, but harder to navigate. Finally found Leicester Square and it was closed (!) for renovations. Had a mediocre Chinese meal, then another stroll, taking in the Peep Show district. Oops, wrong turn! Much cleaner than Times Square, though! Another pub, then Picadilly Circus for the Tube home. I like the Tube more every t6ime we take it . We never wait more than 5 minutes. Signs everywhere, including ones in the station giving the destination and time to arrival of the next 3 trains. Very clean, with cloth padded seats that would last about 5 minutes in New York. We took the bus back and forth from the Tube today – double decker, and it too runs about every 10 minutes. BBC says no rain tomorrow. Strangely, the only forecast one day in advance. Oops – also saw 10 Downing Street from a distance. Tomorrow – who knows?